If you're getting ready to spend a few days at the beach, make sure you pack everything you need to enjoy some fun in the sun. Whether you're packing only for yourself or if you need to pack clothing and gear for several family members, you're sure to find this beach vacation packing list to be a helpful trip preparation tool. 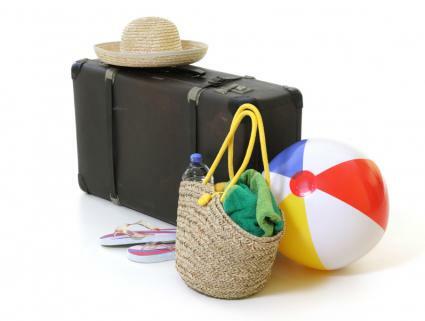 Before you start tossing swimsuits and flip flops into your suitcase, take the time to download and print the packing checklist provided here. Rather than being a general vacation packing list, this particular document is created specifically with the needs of beach vacationers in mind. Use this tool to stay organized, keep track of what has already been packed, and make sure that you include everything needed for your trip. Simply click on the image below. Once you have clicked the image, a printable PDF that can be customized to meet your specific packing needs will open in your browser. Click the diskette icon if you'd like to save the list to your hard drive. Click the printer icon if you'd like a hard copy. Review the list to see if it matches your needs. You can use the "X" button to remove rows that you do not need and the "+" button to add rows. 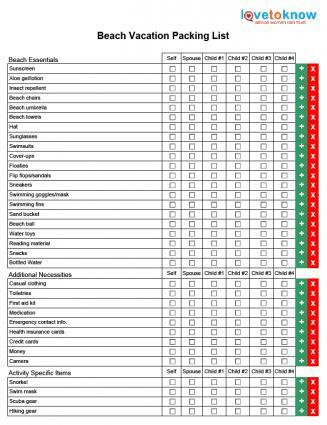 Click the boxes as you pack items if you are using the computerized version of the form or mark of items with a pen or pencil if you're using a hard copy. You'll find the process of getting prepared to head to the beach for a few days - or longer! - is much less stressful when you use a printable packing list designed specifically for the type of vacation you are taking. You'll be able to relax and de-stress prior to your trip when you use this list, because doing so will allow you to be certain that you've included everything you need.